31/12/12 - Ringing Out 2012 - This is the last latest news update on this page. From 11.40pm to 11.55pm we rang our back 8 bells to ring out the old year and say goodbye to 2012. At exactly midnight (we had the radio on) 12 strokes of our Tenor signified the start of 2013. We rang all 10 bells to welcome in 2013 then celebrated with a glass of wine and fired off a few party poppers. It's been a good year for us, 12 months of ringing on our new 10, ringing for the Olympics and the Queens Jubilee, some new people joining us to learn to ring, 100 peals at Ecclesfield and being on BBC Breakfast. 2013 has something to live up to! The team who were ringing in 2013. Ecclesfield Church was invited by BBC Breakfast to be the venue to present a report on a study by The Churches Conservation Trust and a fitness charity which found campanology improves core strength, agility and co-ordination. We were up at 5.00am to meet the BBC reporters and crew. All 10 bells ringing and footage of the ringers was broadcast live on National Television at 6.00am. Each half hour the programme returned to us and more ringing and interviews were broadcast. By 9.30 it was all over. Great atmosphere and an exciting experience for us all. We would like to thank our neighbours nearby for their goodwill and tolerance of bells being rung so early. After the Baptism Service we rang a Special Quarter Peal to celebrate the Baptism of Constance Frances Pearl Swallow. 1296 changes of Plain Bob Major rung in 46 minutes. More information. As part of the Christmas Fayre we opened the tower to members of the public to visit. Many people took advantage of the opportunity to see the ringing room, the church clock, the bells in the belfry, photos, cctv of the bells and to see a ringer ringing a bell and to be in the belfry to watch and hear the bell ring. If you came to see us and are interested in taking up bell ringing, please contact us at: ecclesfieldtower@hotmail.co.uk Or come and visit us on Tuesday evenings at 7.30pm. We rang a Quarter Peal this evening, 1288 changes of Little Bob Major in 48 minutes. 6 members of our team and 2 ringing friends from St Leonard's Thrybergh, and St Peter's Barnburgh. More information. Members of the Yorkshire Association of Change Ringers rang a Peal of 5031 Stedman Caters on Saturday evening. Starting at 5.00pm the Peal lasted 3 hours and 4 minutes. More information. After the morning services our team rang a Quarter Peal for Trafalgar Day and the 12th Wedding Anniversary of Dawn and Malcolm. 1260 changes of Plain Bob Doubles in 43 minutes on the front 6 bells. More information. The bells were ringing on Saturday afternoon before the renewal of vows service for John and Jeni Fryer. On Sunday morning after the morning service we rang a Quarter Peal as a Golden Wedding compliment and congratulations to John and Jeni. 1264 changes of Plain Bob Major on the back eight in 47 minutes. John then rang with us for a course of Plain Bob Doubles. More information about the Quarter Peal. Our ringers joined others from Sheffield and Rotherham for a day out ringing around Rutland Water. Churches visited to ring were Greetham, Cottesmore, Oakham, Hambleton, Empingham and North Luffenham. A very nice pub lunch was taken at the Grainstore Brewery/pub in Oakham. Our Friday night simulator sessions have been well attended with ringers from Wortley and Bolsterstone joining us to gain experience. Barnburgh ringers have been regular attendees on Friday and Tuesday. Our own young learners are making good progress. Our Friday regulars have been trying out several doubles variations and minor methods. One of our ringers on holiday in Northumberland attended the practice night ringing at Bamburgh. On Friday 28th we helped out St Leonard's Wortley by providing a team to ring for a wedding. Members of the Yorkshire Association of Change Ringers rang a Peal on Saturday morning. 5000 changes in a new method which has been named Ecclesfield Delight Royal. The Peal lasted 3 hours. There are now 3 Ecclesfield named methods. Ecclesfield Treble Bob Minor, Ecclesfield Surprise Royal and now Ecclesfield Delight Royal. More information about the Peal. Tonight we rang a Quarter Peal to celebrate the opening of the 2012 Paralympic Games. In 48 minutes we rang 1280 changes of Plain Bob Major. More information. On our The Bells page we have added a photograph of the bells in the churchyard when they were lowered from the tower by Gillett and Johnston in 1952. The photo was provided by the family of Les Smith who was Tower Captain at Ecclesfield. We had a very busy and enjoyable practice night. 14 of our ringers and 7 visitors from Penistone, Rotherham, Barnburgh, Wortley and Sheffield Cathedral saw a total of 21 ringers in the ringing chamber. We welcome visitors to our practices either ringers or none ringers. If you are interested, please come and see us. We rang a Quarter Peal this evening for the end of the 2012 Olympic Games and to congratulate Rebecca Turner for taking part in the swimming. 1260 Plain Bob Triples in 46 minutes. More information. We welcomed around 30 ringers this morning who had travelled from Tideswell where they had been staying on their ringing outing. The ringers were actually from North Yorkshire and Durham area. All 10 bells were rung to a variety of methods between 10 am and 11 am. After ringing at Ecclesfield they were off to Rawmarsh to ring at St Mary's. Six members of our team travelled to Adwick-le-Street in Doncaster to ring the 6 bells at St Laurence's Church for a wedding. We enjoyed our little outing into the Central Branch on a lovely sunny day. Our team and some ringing friends rang the bells to celebrate the 2012 London Olympics. In common with thousands of individual people across the UK and teams in many churches bells were rung for 3 minutes between 8.12am and 8.15am. We had 14 ringers in the tower and we took turns to ring all our bells and some of our handbells. More information. Members of the team have had another busy Saturday of ringing. Some of us helped out with the Branch Training Day based at St Mary's Church, Walkley. In the afternoon students on the course visited several Sheffield towers for practical sessions. Ecclesfield was one of the training locations and members of our team acted as helpers. After this finished our team rang the bells for a wedding. Two members of our team not involved with the training day or the wedding helped out with ringing for a wedding at Rotherham Minster. This morning members of the Yorkshire Association of Change Ringers rang a Peal of Cambridge Surprise Royal. 5040 changes on all 10 bells in 3 hours and 10 minutes. This is the 5th Peal at Ecclesfield this year. The last time there were 5 Peals in a year was 1976. The total number of Peals rung at Ecclesfield is now 97. More information about the Peal. The Olympic Flame was is South Yorkshire today. Leaving Barnsley it arrived in Chapeltown and then passed through Ecclesfield right outside our Church. We made sure the bells were ringing for this occasion. We rang a Quarter Peal today to celebrate the Ruby Wedding Anniversary of Kath and Phil Craven. 1260 changes of Plain Bob Minor on the front 6 bells. More information. We held our usual practice night tonight and were joined by the team from St John's, Ranmoor. On Tuesday 5th June 2012 a Quarter Peal was rung for the Queen's Diamond Jubilee. 1287 Grandsire Triples in 48 minutes. More information. On Wednesday 23rd May during the afternoon visiting members of the Yorkshire Association of Change Ringers rang a Peal of Nideggen Surprise Royal. 5040 changes in 3 hours and 4 minutes. More information about the Peal. Ecclesfield hosted the branch striking competition this afternoon. The aim of a striking competition is for teams to ring the bells as accurately as possible. The ringing is judged and faults are counted. The team with the least faults total at the end of the competition wins. The test piece normally takes about 10 minutes to ring. The winning team was Sheffield Cathedral A Team, 2nd place was Ecclesfield and 3rd place was Sheffield Cathedral B Team. There were 5 teams taking part. Refreshments were provided in the Church and some general ringing followed to finish off the evening. A Quarter Peal was rung prior to the Holy Communion Evening Service by the Sunday Service team. 1260 changes of Plain Bob Minor in 44 minutes. This was the first quarter of Minor on the front 6 of the augmented 10. More information. 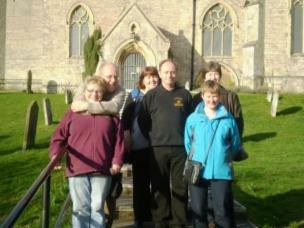 We had a team of visiting ringers at 1.30pm to ring a Quarter Peal. They rang a quarter peal of 1259 Grandsire Caters in 48minutes, finishing just before the first wedding of the day. Before ringing at Ecclesfield they had been at St Michael & All Angels Hathersage. After leaving us they were off to St Mary's Rawmarsh and St Mary Magdalene, Whiston. This quarter was rung on the Annual Cheshire Ringers' Quarter Peal Day. This was the first quarter of Grandsire Caters on the bells. More information. On Sunday 15th April visiting members of the Yorkshire Association of Change Ringers rang a Peal of Bristol Surprise Royal. 5000 changes in 3 hours and 3 minutes. More information about the Peal. Six members of our team joined ringing friends from the YACR Sheffield Branch, Central Branch and the Derbyshire Association to ring on the 6 bells at Clowne and the 8 bells at Creswell. We had a very enjoyable afternoon and finished with a lovely evening meal at The Royal Oak, Barlborough. This evening we rang a Special Quarter Peal to celebrate the Diamond Wedding Anniversary of Sheila and Ray Betts. 1260 changes of Plain Bob Triples 48 minutes. More information about this Quarter Peal. This morning members of Ancient Society of College Youths rang a 10 bell Peal of 5040 changes in 3 hours and 13 minutes. It was a new method, not rung before and the team have named the method Ecclesfield Surprise Royal. 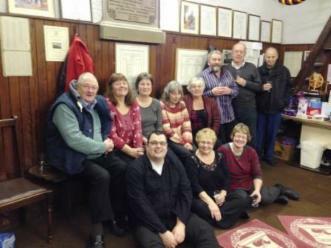 We would like to congratulate Malcolm Turner the conductor of the peal as it was his 2000th peal. More information. Prior to the Evening Service we rang a Quarter Peal. 600 changes of Grandsire and 660 changes of Plain Bob Doubles in 42 minutes. Yvonne rang the Treble and it was her first quarter peal. It was also the first quarter peal on the front 6 bells since augmentation to 10. More information. 10th March 2012 - An Afternoon in Nottinghamshire. Seven of us decided to have an afternoon out ringing just over the border in Nottinghamshire today. We rang at 2 towers during the afternoon. The first was All Saints Harworth, a 6 bell tower 8 miles north of Worksop. Then we moved on to our second tower, Holy Trinity Everton, 5 miles further east. We enjoyed our ringing on these 2 good sixes and the sunny day and mild weather was a bonus. To finish our day we had a lovely evening pub meal in the Blacksmiths Arms in Everton. The team outside Harworth church. Jennifer, Stuart, June, Andrew, Yvonne and Lynn. Not in the picture Stuart H taking the photo. Some of our team met up with other ringers from the Sheffield & District Branch of the YACR for an afternoons ringing on the 8 bells at All Hallows, Harthill A ringer's tea and business meeting followed then evening ringing on the.8 bells at St James, South Anston. 22 February 2012 - Ringing for the Ash Wednesday Service and for the Centenary of Ecclesfield Cubs and Scouts. The bells were rung prior to the Ash Wednesday Service and to celebrate the Centenary of the Ecclesfield Cubs and Scouts. 1100 changes of Plain Bob Doubles on the back six bells. More information. We were joined by members of The Rotary Club of Wortley at our Tuesday night practice. Following a talk given some months ago by our Tower Captain members of the group came to see for themselves what bell ringing is about. Ringing demonstrations on bells from 6, 8 and all 10 were given plus some of the group went up to see the bells in the belfry. The first 10 bell peal at Ecclesfield and the first peal on the recently remodelled and augmented bells was rung on the morning of Saturday 18th by members of the Yorkshire Association of Change Ringers. 5040 changes of Yorkshire Surprise Royal were rung in 3 hours and 3 minutes. More information about the peal. The Service of Blessing and Dedication for the newly augmented bells was held at 4pm. Before the service began a Quarter Peal of Plain Bob Royal was rung by members of the Yorkshire Association of Change Ringers. Around 120 people attended the service to celebrate the augmented and re-tuned ring of 10 and to dedicate them to the glory of God. The service was conducted by the Vicar of Ecclesfield, The Revd. Daniel Hartley. At the Dedication and Blessing the Vicar handed a bell rope to Tower Captain Philip Hirst and Ringing Master Stuart Armeson. Philip then pulled on a bell rope attached to the one of the bells in the belfry which responded by ringing out over Ecclesfield. The Readings were from Haggai 1.15b - 2.9 and from Rev. Alfred Gatty's book The Bell, Its Origin, History and Uses. Published in 1848 page 26 describes the celebrations at the time of the augmentation of Ecclesfield's bells in 1845. After the service light refreshments were enjoyed by the congregation and there was an opportunity for visiting ringers to try out the new 10. You can listen to the service by going to St Mary's Ecclesfield Website, Listen Again page and clicking on the link. Some of our team went to the Yorkshire Association Ringing Meeting on Saturday 4th February. On a day when snow was forecast ringers met up to ring at Northowram, Lightcliffe and Brighouse before the lunch and meeting. Several members of our team joined others in ringing at the Minster Church of St George, Doncaster during the afternoon then in the evening at St Mary the Virgin, Sprotbrough. This was a ringing meeting organised by the Central Branch of the Yorkshire Association of Change Ringers. Prior to the Epiphany Evening Service a Quarter Peal of 1260 Grandsire Triples was rung in 47 minutes. More information. 9 Ecclesfield ringers joined in ringing with other ringers from the Sheffield/Rotherham area at St Mary's, Walkey during the afternoon as part of the Sheffield Branch ringing meeting. Following a superb tea and business meeting ringing moved on to the 12 bells of Sheffield Cathedral. From 11.30pm to 11.55pm Ecclesfield's bells rang out the last minutes of 2011. Exactly at the same time as Big Ben struck the first blow of midnight our Tenor bell also struck the first of 12 strokes to signal the start of 2012. Then all 10 bells rang out and the sound of our bells mixed with the sound of fireworks, cheering and other celebrations in the village. Ringing bells to signal the New Year takes place throughout the world. It has probably been a traditional part of Ecclesfield celebrations for hundreds of years but this year was special. Never before in the 400+ years of ringing at St Mary's has the sound of 10 bells been heard welcoming in the New Year. 10 bells all tuned and sounding better than they have ever done before. Ring Out, Wild Bells" is a poem by Alfred, Lord Tennyson. Often recited on New Years Eve the first 2 verses are below and the full version and explanation is here on Wikipedia.